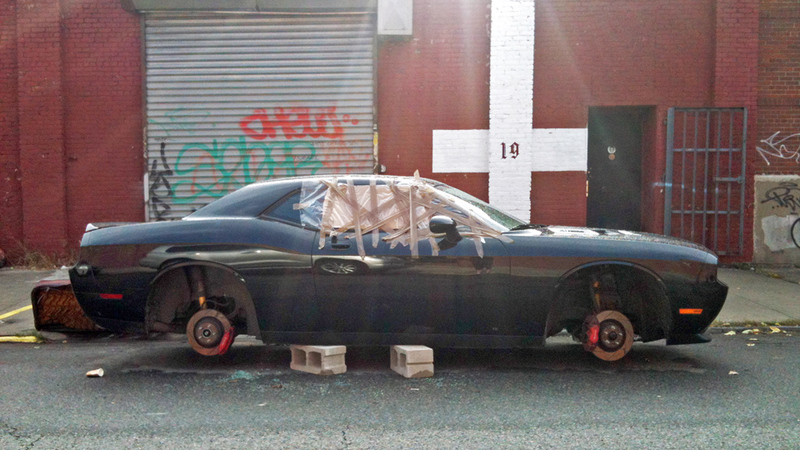 Every so often, your local TV news or newspaper may run a story about tire thefts on the rise in your fair city. The police will weigh in, warn you to park in a well-lit area, and maybe there'll be a few images like the one above. If you haven't seen one yet, chances are you won't have to wait long -- because all signs point to tires and wheel thefts as one part of the economy that's growing strongly. No official agency or trade group collects statistics on wheel and tire thefts, and it's all too easy to blow a few incidents into a national trend. But the sheer number of reports from around the country suggest a rising trend in wheel and tire swiping, with some regional variation. In New York City, where the New York Police Department has tracked a rising trend of thefts for the past three years, it's Japanese cars getting hit hardest; in Houston, it's full-size General Motors SUVs; in Georgia, Jeep Wranglers and Libertys. Tires and wheels offer a near-perfect combination of attributes to thieves. They're easy to haul, quick to remove, untraceable on online auction or classified sites, and frequently usable on several different vehicles, with a value that can hit $3,000 a set. A typical theft takes about five minutes, as shown by this video of two thieves caught on a security camera who took time to run lookouts during their daylight swipe. The most-frequently mentioned target on auto forums remains the Honda Fit, since its alloy wheels can fit older Honda Civics, but most new cars and trucks now come with alloy wheels standard, giving thieves far more targets for high-end sales than before. What distinguishes some of these recent reports from previous tire theft alarms is just how organized the crime has become. In Greensboro, N.C., six commercial truck operators have been hit in the past several weeks by thieves stealing semi truck tires and wheels -- in one case, hauling off 20 wheels in one night. 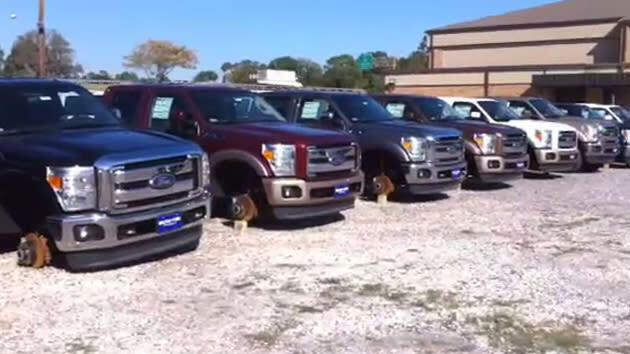 Two weeks ago, thieves swiped 70 tires from a Honda dealership in New Rochelle, N.Y. Last November, an unknown number of thieves hit this lot at Bolton Ford in Lake Charles, La., swiping 72 tires and wheels from heavy-duty Ford pickups. Police estimate it took the crew about an hour to take the tires from 19 trucks. While lugnut wheel locks can make a thief pause, many are so easily defeated they draw into question the definition of "lock" -- if a portable power tool can't take it off, most can be chiseled away. New York lawmakers proposed a bill last year requiring that wheels be etched with a vehicle identification number, which would at least give police some method of tracking stolen wheels, but the measure hasn't been passed. Etching would be useful if you can find your wheels once they're stolen, but doesn't make the theft itself any more difficult. Owners who sink several thousand dollars into the wheels can get even more expensive wheel locks that can run $350 or more. It's the cost of extra protection versus the value of what's lost that keeps stolen wheels a hot item -- and in a tough economy, an easy target.